Take the Field projection. Photo by Bruce Silcox. Take the Field expands the participatory nature of sports by creating a giant art event for the athletic field. Corners of the city beckon, encouraging us to remember the land as it might have been before our ancestors arrived. Intimate audio whispers transport Take the Fielders across scales of time and space. Careening lights and reflectors transform Kix Field on the Greenway into an ephemeral boundary between present and past, demanding a frontiersman’s dual capacity for athleticism and meditative vision. The Phillips neighborhood has always used manufacturing, the work of the hand, to create itself. 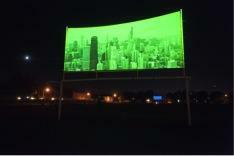 Looping, human actions will manifest a new urban vision on the playing field for one special night. This activity is made possible by the voters of Minnesota through a grant from the Minnesota State Arts Board, thanks to a legislative appropriation from the arts and cultural heritage fund. Additional support provided by Urban Venutures - Kix Field.